I have a great spring recipe for you today. One that is gluten free and scrumptious. Campbells kindly asked me to enter a contest using Campbells No Added Salt Vegetable Broth for Celiac Awareness Month. I, of course thought of soup, but not a plain old soup, no, one that is deliciously full of vegetables, cream and cheese!! Brie Cheese!! One of my favorite cheeses and then accentuated with a nice touch of tarragon, an underutilized herb that adds some wonderful flavors for Spring also. Asparagus and mushroom is a perfect Springtime combination to awaken our senses again from heavy laden stew and potage of winter. Using a little extra stock makes for a lighter soup, one that is fit for Spring, especially when it is a lovely vegetable broth like Campbell has. I have to be honest and tell you, that in my opinion Campbells broth is my number one favorite after my own homemade broth. I use broths a lot in my cooking to braise, make sauces, gravies, soups and stews. Broth is used in all ethnic dishes from Asian to European. We always have some chicken, beef and vegetable broth on hand, ALWAYS!! You can use broth for tons of recipes as I said, and I do, but my favorite is soup!! I love making homemade soups. Our daughter says now she doesn’t like asparagus but put this bowl of soup in front of her and it is gone. A great way to get your family to eat more vegetables is to make a wonderful soup and now it can be gluten free and lower in sodium!! 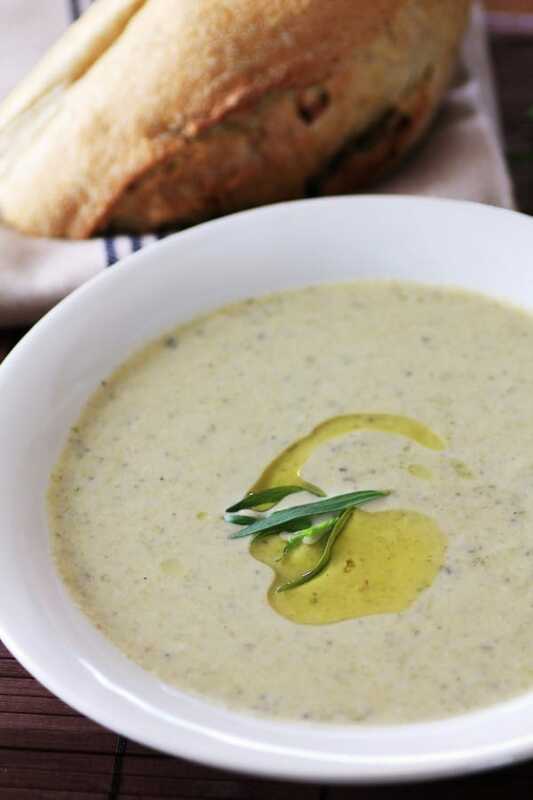 France has some beautiful soups and that is where my inspiration came from, using Brie Cheese and tarragon. Do you think a gorgeous soup like this is hard to make? Think again, it couldn’t be easier, especially with ready made broth from Campbells. Do you think you need flour to thicken a soup? Never!! 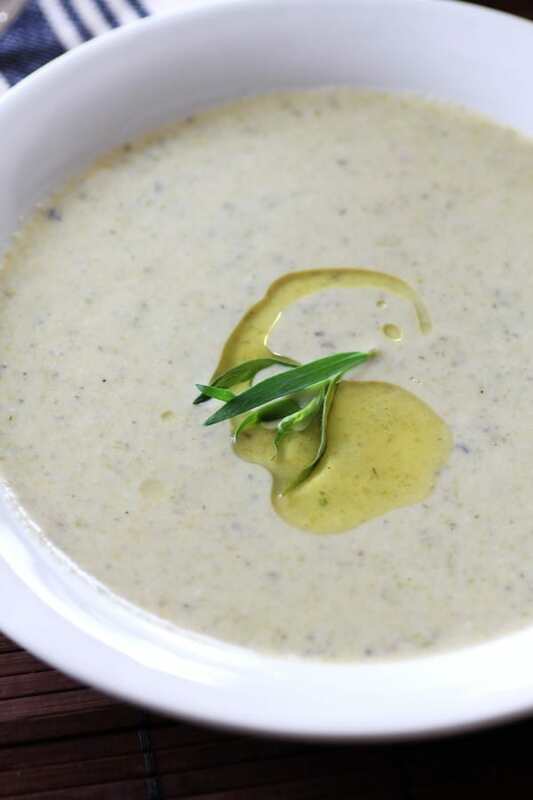 Let the vegetables be the thickener or cheese and you have a gorgeous gluten free soup always!! I hope you try this soup, ENJOY!! Roast asparagus drizzled with 1 Tbsp. olive oil with salt and pepper in a 375F oven, on a rimmed baking sheet, until tender and slightly browned, 10-15 min. Meanwhile, saute onion and mushrooms in the remaining 1 Tbsp. olive oil in a large pot until tender, about 5 min. Add the garlic and saute for 1 min. Add the white wine and reduce to less than ½. Add the roasted asparagus cut into 1" chunks and the Campbells No Added Salt Vegetable Broth, cook for 20 min. Add the brie cheese and stir to start to melt, the rind won't melt but don't worry as you blend it. Add the tarragon and salt and pepper to taste. Carefully transfer the soup into a blender in small batches and blend until smooth. You will need another bowl to put the soup in for a moment as you continue to puree. Pour the soup then back into the pot and reheat over low heat adding the cream. Serve with a drizzle of good quality olive oil and gluten free bread. This post is brought to you in partnership with Campbell Company of Canada. I received no financial compensation for this post. Opinions are honest and my own.Campbell Company of Canada provided me with product to develop this recipe. 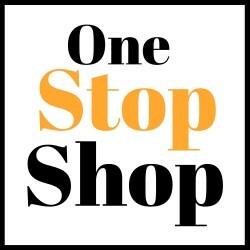 Tara, I absolutely love Campbell’s beef broth and use it all the time for beef recipes. This soup sounds heavenly and is packed with wonderful flavors. Thank you so much for coming over and commenting Patty, I so appreciate it!! Asparagus, mushroom, garlic and brie… sounds like a spectacular combination! Thanks so much for sharing Tara! Looks delicious and how nice to hear it’s gluten free! 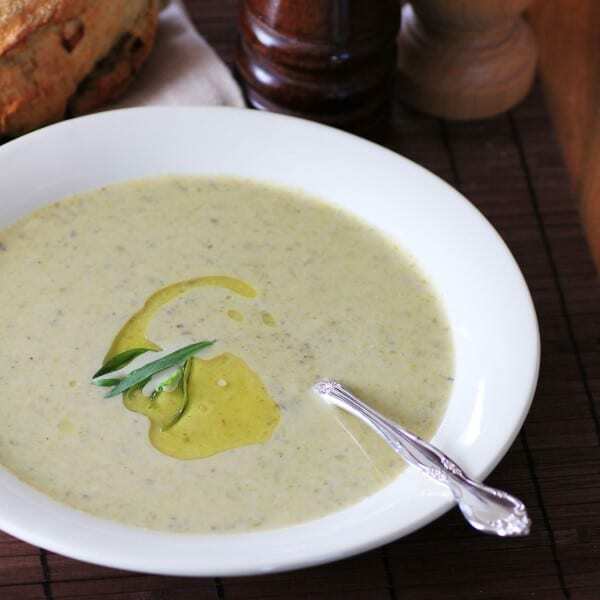 This is a delicious looking soup; I love asparagus and the Brie puts it over the top. Great recipe!! You are welcome, thank you for hosting!! This looks and sounds amazing! I can’t wait to try it. Love the idea of brie in the soup. MMMMM! This looks just gorgeous Tara! I’ve never put brie in soup before but now I’m wondering why on earth not because that looks amazing! I always trust Campbell’s when it comes to soups and broths. I love this recipe with its delicious seasonal ingredients (asparagus is a particular favourite of mine) and also the yummy brie! I love this recipe! Asparagus and brie go SO good together! Yummmmm! Thank you Brandi, appreciate you coming over!! G’day! Looks great Tara! Congrats for also being featured in the Olive and Grapevine weekly! Thanks so much Joanne, I am loving the Olive and Grapevine!! This soup is gorgeous! I never thought of making soup with brie but now I can’t stop thinking of it! Thank you so much, we loved it!! I adore brie!! i just made this soup for my husband. We think it is delicious beyond words! Can’t wait to make it for company. Thank you! I am so glad you enjoyed it and thank you for taking the time to come and tell me.